The weather this morning was great for the Philadelphia Distance Run as a record number of participants made their way to the starting corrals for the 13.1 mile event. With over 13,000 finishers the course was quite congested moving through the downtown city streets. Even after 8.5 miles the runners were relatively thick as I pulled off to the side for a photo as we crossed the Falls Bridge over the Schuylkill River. In this case as with most the real fun of the run comes before or after the main event. While the sun beats down on you for 13.1 miles there are times when you certainly question your logic of spending a bundle to travel to a race. Some runners customize their shirts with sayings or pin notes on their back and one that caught my eye today said Running Costs $7.50 per Mile. I dwelled on the theory for awhile and must be doing something wrong because I cannot even do a 5k ( 3.1 miles ) that cheap. 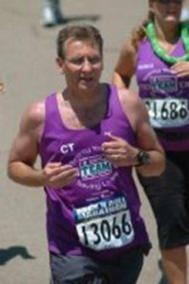 My next big event is the ING Hartford Marathon coming up on October 11, 2008. In the meantime if you'd like to talk about Running or Real Estate on the Connecticut Shoreline contact me, Dan@CummingsTeam.com or call my Access Line at 203-672-2455. Hey Dan ... glad that you had a good run in spite of the impression I gave you about Phila being dirty! Hey ...it's a very old city. Congrats on the run. Dan, I hope that you did not have to watch out for what you were stepping in like on the beach in Florida. What was your time for the 1/2 Marathon??? George... The downside of city running is dodging the pot holes that will twist your ankle. Time wasn't a new record for this distance, ran a pace of 10:29 but calculated the cost of that photo stop on the bridge was 15 seconds per mile. Suzanne... I did mentally crunch numbers along the run but without seeing the "work" I'm not sure what to include. Factoring in the hotel, gas and tolls the cost is in excess of $30 a mile. Hi Dan another race? Wow you really are tearing up the race tracks across america! So, how did you measure up to what you were shooting for? Bill... Always have another one on the horizon, Hartford Marathon is in three weeks and the half there last year was my best time for that distance. I've heard you double your half time and add 10 minutes to determine marathon time so based on yesterday 4:45 is the target but think I'll be closer to 5 hours. Jason... I expected to hit 10 minute miles so I arrived at the finish line 6-1/2 minutes late. Leslie... Who said running has to be painful? A few years ago when I first started walking I had plenty of shin pain but it subsided. Once I progressed into running my knees did give me some trouble but with after a few months I realized the importance of stretching and the pain went away. After yesterday's run I felt fine and actually spent the afternoon today climbing up and down a ladder re-siding my house. Thesa... That was my only photo stop, I've been falling into goof off mode way too much. Friday night was chilly here but it warmed up again and I actually got a noticable tan line on my arms while running this event Sunday morning. How was your pacing? Did you finish strong? I've been watching your tweets. Your mileage is fantastic, you'll be ready for the ING. Craig... I thought I'd do a 10 minute pace but went a little slower finishing strong with an average of 10:29. The crowd was thick through the downtown streets so it was a slow start but I was right on the mark at at 5k and a little ahead at 10k. I fall off in the longer distance, at 10 miles I dropped to a 10:11 pace and really slowed down the last three miles. Well done! 10:29 isn't all that far off Dan. Could it have been impacted by the hoards of people participating? Running the morning before? Or, some nasty Bud earlier in the weekend? Thanks for the photo's. I've always liked Philly myself. The buildings (art museum, city hall, etc) are interesting. Scott... A little of everything probally contributes to the time but I don't really beat myself up for some silly target time. Even adjust my pace to keep things in focus! Shoot Dan, a slow start is fine. Save it for the end. Your pacing looks dead on to me!